These simple yoga poses are perfect for beginners looking to achieve more flexibility and get rid of belly fat. Belly fat is common for office ladies and those who don’t exercise too much. Basically it’s the fat in the abdominal cavity, the belly fat, that causes major issues. Belly fat can be the most stubborn one and most difficult to reduce. So if you are willing to reduce belly fat in most effective and efficient manner, follow our Beauty Channel to start these YOGA postures, along with proper nutrition and proper diet. P.S: To boost your metabolism, do these yoga asanas in the morning and repeat these poses daily, 3-5 times, three days a week and take a day off. This posture helps you strengthen the ab muscle along with the entire upper body and back, making your spine strong yet very flexible. It also helps u reduce fat. STEPS: 1) Lie on stomach, legs stretched and palms under each shoulder. 2) Inhale slowly and raise your chest, bending it back as far as possible. 3) Try holding this for 15 to 30 seconds. Then exhale slowly and bring your body down. 4) Repeat this five times, taking a rest of 15 seconds between every repetition. CAUTION: Incase you have an ulcer, hernia or any back injury, or you are pregnant, then do not do this. This gives strengths to the core of abs. It also puts your digestive system to work and fights constipation. To reach the full potential of this, you should try rolling back and forth i.e. massage the abdominal area. STEPS: 1) Start by lying on your stomach with hands on either side. 2) Then, bend your knees and try holding your ankles with your hands. Inhale slowly while doing this. 3) Hold this pose for 15 to 30 seconds, then slowly exhale and bring your body back to original position. 4) Repeat this atlas five times, with a rest of 15 seconds between every repetition. This pose relieves your back pain, firms the abs, thighs, hips. It even massages colon, balances the pH levels within the stomach, cures constipation and enhances your metabolism. In short this pose has lots of benefits. STEPS: 1) Lie on your back, stretch your feet with your heels touching each other. 2) Exhale, and bend your knees and bring them to your chest. With the help of thighs, apply pressure on your belly. To keep your legs in place, clasp your hand under your thighs. 3) Breathe deeply and hold this pose for 90 seconds. Exhale and return to original posture. 4) Repeat this five times, taking a rest of 15 seconds between every repetition. This pose directly attacks the fat at the waist. It is best for stomach and also strengthens the muscles of legs and back. STEPS: 1) Lie on your back, with arms at your side. 2) Inhale and start raising your legs, and do not bend them while doing so, raise them as high as possible. Also stretch your arms in an attempt to touch your toes, try creating 45-degree angle. 3) Hold the pose for 15 seconds. Exhale and return to original posture. 4) Repeat this five times, taking a rest of 15 seconds between every repetition. 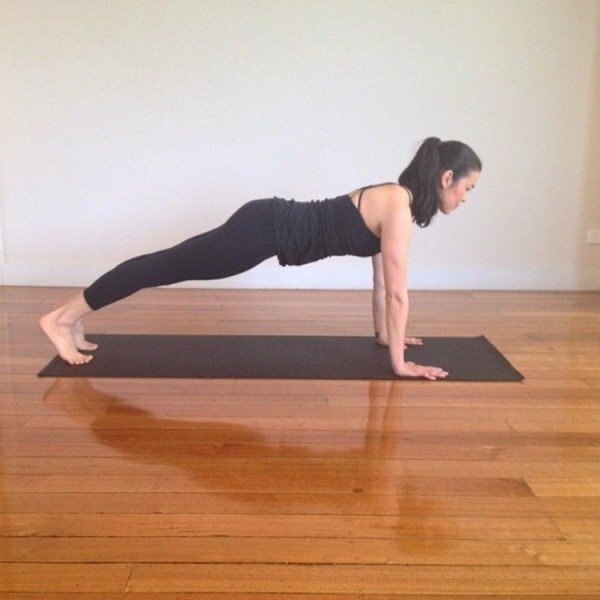 This is the most effortless and effective pose in reducing your belly fat. It gives strength to shoulders, arms, back, thighs, and buttocks. STEPS: 1) Lie on stomach, legs stretched and palms under each shoulder. 2) Tuck the toes and start to step back to extend your legs behind. Keep inhaling, and look ahead of palms so that the neck and spine are aligned. 3) Forearms should be in straight line with head to heel. Make sure that your fingers are spread wide. Hold this pose for 15 to 30 seconds. 4) Exhale and drop to your knees. Repeat this five times, taking a rest of 15 seconds between every repetition. 5) For more effective results hold this pose for as long as possible.